Birthday thank you note can be one line replay or you can make it warm and heart felting. Their birthday wishes and presence has made the occasion a memorable one to you even after the party ends. Their wishes are conveyed their love and consideration to you!!! Thank you for giving me some birthday wishes! we’re always just a few clicks of the keyboard away. Whether you knew it was my birthday or not, I’m really glad to hear from you. It means a lot to know that so many people care about me to wish me happy birthday. You’re a good friend, and I’m glad to have you around me. Thank you for the birthday messages, and I hope this card finds you well. While a lot of people have abandoned Facebook, I’m glad that its still bringing people like us together for the special moments of our lives. Thanks so much for your birthday wishes, and I’ll make sure to return the favor! Happy birthday to me, happy birthday to me, with friends such as you, I’m as glad as can be! Thank you so much for getting in touch for the birthday wishes, and I hope that you’re having a good time whatever you’re doing. As time goes on, the people we know spread out more and more across the world. But I’m happy to know that there are people across the world who care enough to wish me a happy birthday. Thank you so much for the birthday wish! It honestly means a lot that you said something. It’s so easy to just dismiss it as another day, but I’m really glad I have people like you who are willing to give a little time to make a friend feel better. Hey, good to hear from you! Thank you so much for the message. Lets talk sometime soon, over something a little more substantial than a facebook post. Thank God that Facebook reminds us of our friend’s birthdays, otherwise a lot of us would be in so much trouble. But still, it was really nice to hear from you, and thanks for the birthday wishes! Its a shame we couldn’t be together in person on my birthday, but I really appreciate you getting in touch! Let’s chat sometime, I miss talking to you. 365 days of the year, and its hard to keep track of everyone’s birthdays. But I’m glad you managed to get to me on mine. Thank you so much, and all the best for you! A lot of people don’t make the time for people when they don’t have to. But you did, and I’m really glad you did. It just reminds me of why we’re friends. The whole world is linked at their fingertips now, and a few taps of a button can send a message to someone on the other side of the earth. I’m glad, because that means I got to be reminded of how good a friend you are. Thank you so much! Its good to hear from you again! Sorry we haven’t been able to talk much aside from on the internet, but thank you for the “Happy Birthday” regardless! I’m so thankful to have friends like you. There are a lot of people who don’t think that basic courtesy extends to them over the internet. But you took the time to tell a friend Happy Birthday, and I’m glad you’re a part of my life. Make time for your friends, and they’ll make time for you! Which I’m doing now. Because I’m thanking you for the Happy Birthday! So yeah, good on you for being good to me. You’re a good friend to take some time and wish someone else a happy birthday on Facebook. Life is made of little gestures that give people big smiles. Thank you! Your birthday wishes really brought a smile to my face. Thank you so much for getting in touch! I really appreciate it, and I promise to return the favor as soon as I can! I know that it only took a few seconds, but it means a lot that you got in contact with me on my birthday. Thank you so much for the birthday wishes! Thanks so much for the “Happy Birthday”! I’m not sure how many people either don’t care about Facebook or just ignore birthdays now, but I’m glad you’re neither of those things. I love watching the notifications come in on my birthday. And it was a real treat to see your picture pop up with a fresh Happy Birthday. Thank you! Have you ever had your whole face light up when you see something? Thats how I felt when I saw your message on Facebook. Thank you so much for the birthday wishes, and I hope that this card finds you well! I’m really happy to hear from you! Thank you so much for the birthday wish on Facebook, but lets talk in person sometime soon. We can always use a good time out on the town! I admit, I don’t use Facebook much anymore, but its always nice to see how many people turn up and wish me a Happy Birthday on my wall. Thank you so much for thinking of me. I had a really good birthday, and your message on Facebook was just one of the many highlights of the day. Thank you so much for getting in touch, and I hope we get to spend some time in person together soon! It is your birthday and you have started receiving lovely presents and gifts. Must be feeling wonderful? Of course, you should. But are you sending ‘thank you messages’ to all the ones who have send birthday gifts to you? Many people send ‘return gifts’ which is actually a gift that is given in-response to someone’s gift. But as, sending return gifts is not always possible… you should at least send thank you message in response. This will make the sender feel special and warm. 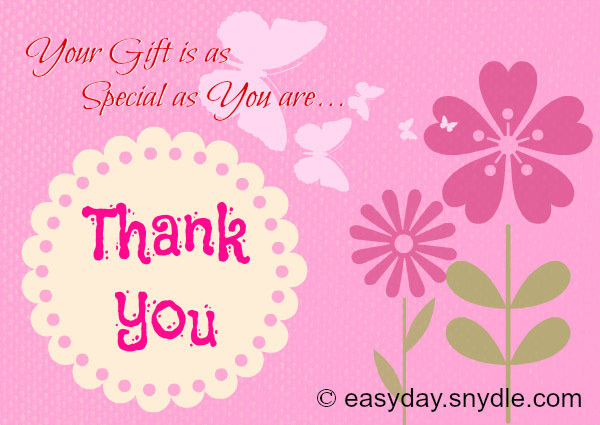 Check out the best thank you messages for birthday gift. Hope you like them all. 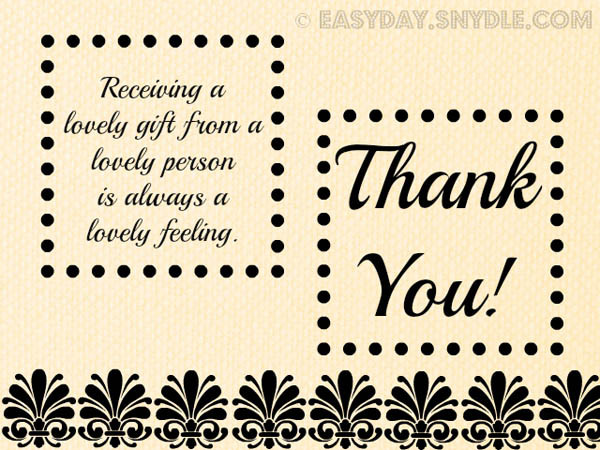 We often send thank you notes when we receive gifts to let the givers know that we loved that gift they gave to us. It’s one great way to show our appreciation for the care, effort and love enveloped to the birthday gifts. 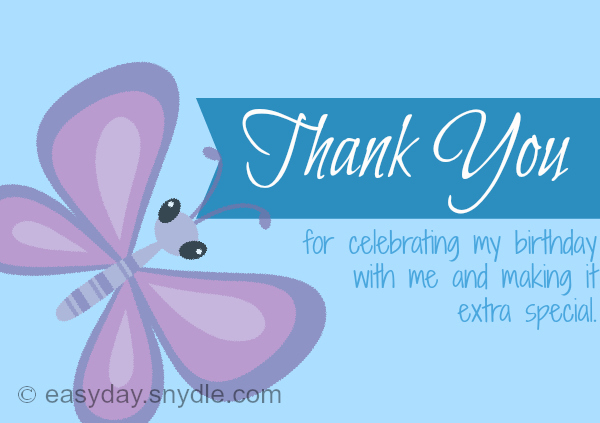 If you’re unsure what to write in a thank you note, here are some samples of birthday thank you messages that you may use. how to make my day even more special. Receiving this surprise gift from your side was truly an amazing moment. Thanks a lot for making my day! but your gift made me realize that you are still near me. is always a lovely feeling. Your gift was the best gift I have received till date. Thank you so much for sending such a lovely gift for me. It was a pleasant surprise. I loved it! Your gift is as special as you are! I seriously loved you gift. yours was the best one. Did you love the birthday gifts you received on your birthday? It’s time to return the favor by sending your warmest thank you notes to your family and friends who made your day extra special through those gifts. 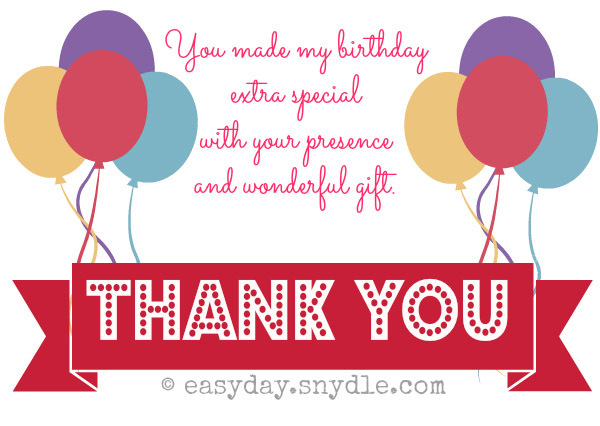 Here are some thank you notes examples for birthday gifts that you can use. I never knew that your choice of gift is so cool. This is the coolest gift I have ever received. With your lovely ideas and wonderful surprise. Gosh!! The gift which you have sent was on top of my wish-list. I am so glad that I got it from you. Your gift is very special. I will always keep it safe and cherish it forever. You are truly a king/queen of gifting!! I wonder how a person can be so creative with gifting ideas. Thanks a lot for sending out such a unique and creative gift. It really means a world to me. but receiving a gift from you was a big joyous moment for me. It is a big thing for me. Thank You! You’re ready to send out your thank you notes for the birthday presents that you got on your birthday but you’re in doubt what to write on it? 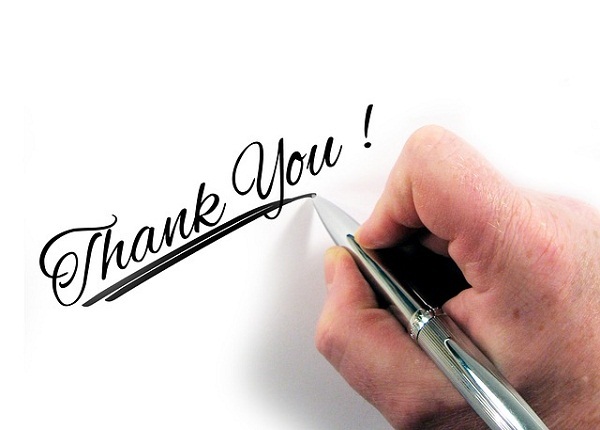 Worry not as here are some examples of thank you messages that you can use for your thank you cards. which could match up with the gift sent by you. but couldn’t find anything that could even match up with your gift. So, I am sending a simple THANK YOU in return to your gift. People promise to gift moon and stars. than the moon and the stars to me. This is one of my favorite gifts. Thanks a lot for picking it up for me. Handmade gifts are a way of expressing love and care. that you care and you love. I will always keep it safe and close to my heart. Your gift has touched my heart and soul. on receiving this beautiful gift from you. 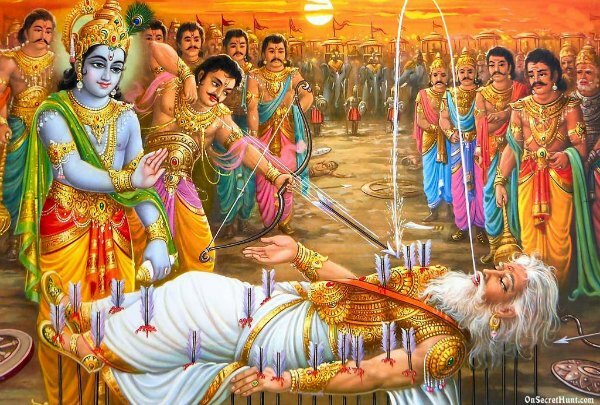 Thanks a trillion, for this great and grand gift! and would keep it safe always. I feel like I am holding your hands. ‘Thank you’ for making me feel your presence. Your gift is out of this world. I truly loved your gift. to let you know how much I loved your gift. Please accept my thanks in return to you special gift. and letting you know that I am over-whelmed on receiving a gift from you.